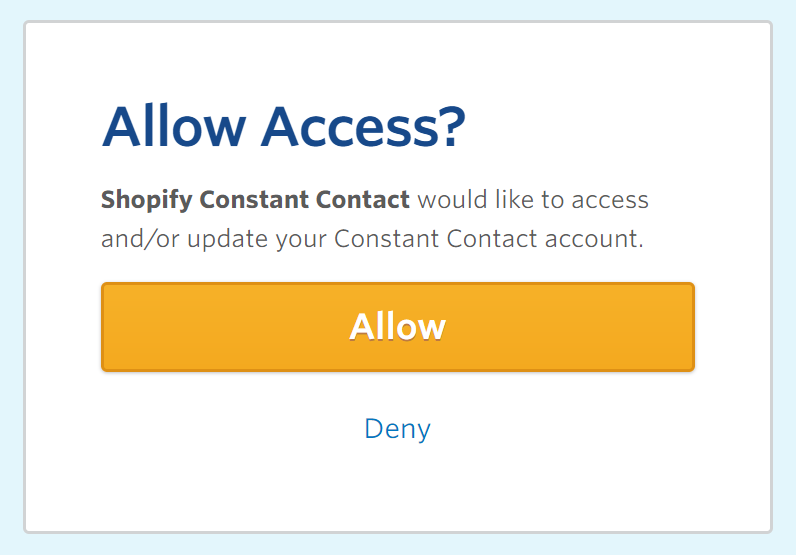 In order to connect your Constant Contact account to your Shopify store you need to create a Constant Contact account first (create account here). Already using Constant Contact? Great! Continue step 2. 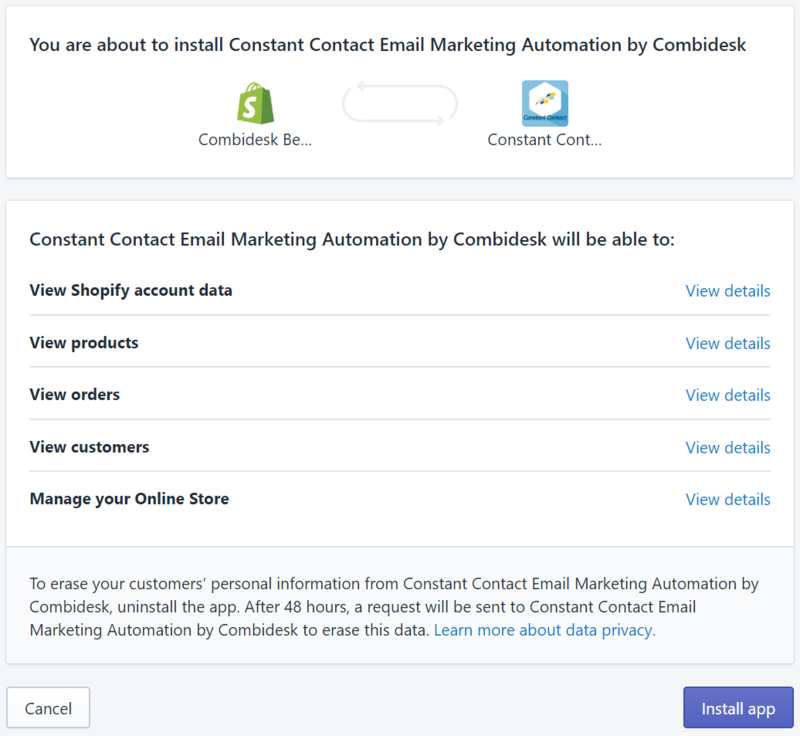 Visit the Constant Contact app in the Shopify app store here and click on the green GET button. Step 4) Connect you Constant Contact account. Click the orange button to connect your Constant Contact account. No account yet? Create your free trial account here. Fill in your Constant Contact credentials (email + password) and login. When you're already logged in you'll see this autorisation screen. Hit 'Allow' and you'll go back to the contfiguration page. You may already have customers and subscribers and want to export them to Constant Contact. Use this step to export existing data. CAUTION: existing customers in Contact Contact are going to be unsubscribed when they don't have the 'accept marketing' checkbox in Shopify. So make sure they are saved in a different ConstantContact list. Make sure you've created a customers list in ConstantContact. Customers are Shopify constact who have purchased at least one item or more. Go to https://ui.constantcontact.com/rnavmap/distui/contacts to create a list. Select this list in the dropdown menu as seen below. Is your list not visible, click the refresh button to update the lists. You can select a mailing list for subscribers and customers. No lists yet? 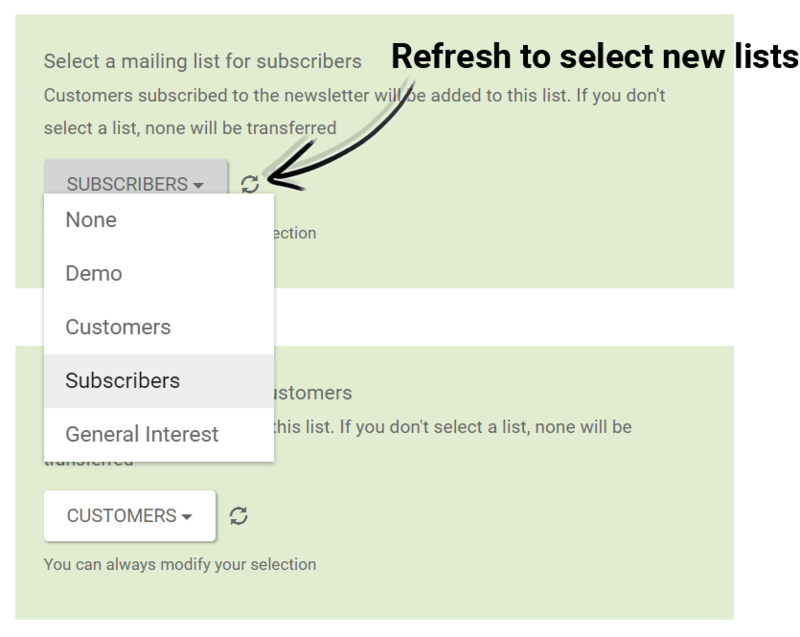 Just create one for subscribers and one for customers, refresh the dropdown list in this step and it will appear new in the dropdown list. 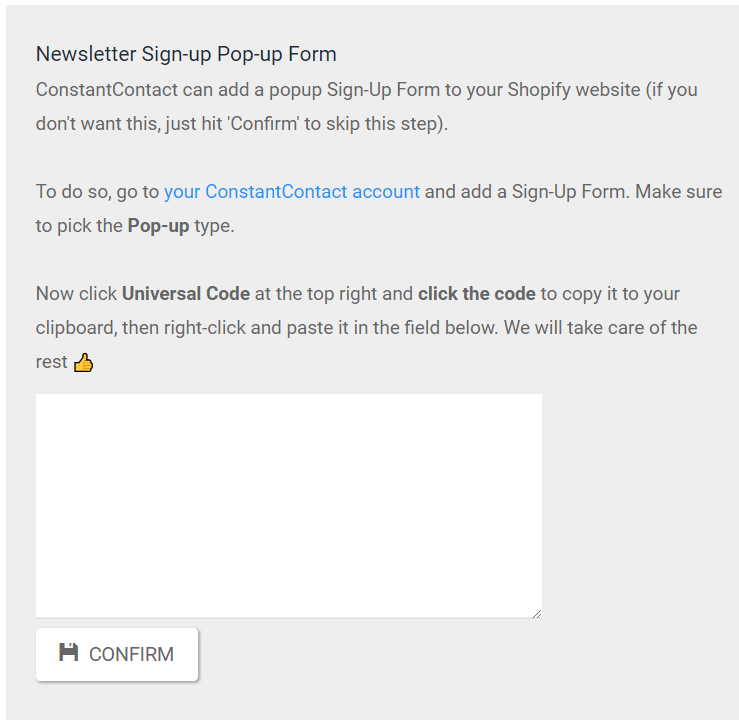 ConstantContact can add a popup Sign-Up Form to your Shopify website (if you don't want this, just hit 'Confirm' to skip this step). To do so, go to your ConstantContact account and add a Sign-Up Form. Make sure to pick the Pop-up type. Do I need to pay for Constant Contact? How do you send out segmented campaigns using custom fields? This is what you need to do in order to send segmented emails based on specific custom fields. It is good to know we sync these fields into ConstantContact. Ps. The reason TAGS aren't filled in the original Tags field is because this field can't be filled through the API (yet). In the search bar on the left click "Advanced". Use the drop-down menus to choose your search parameters. Search your list by specific custom field, etc. Select all of the email addresses that were found by clicking the check box in the upper-left corner of your results. Click Manage Lists > Add to Lists. 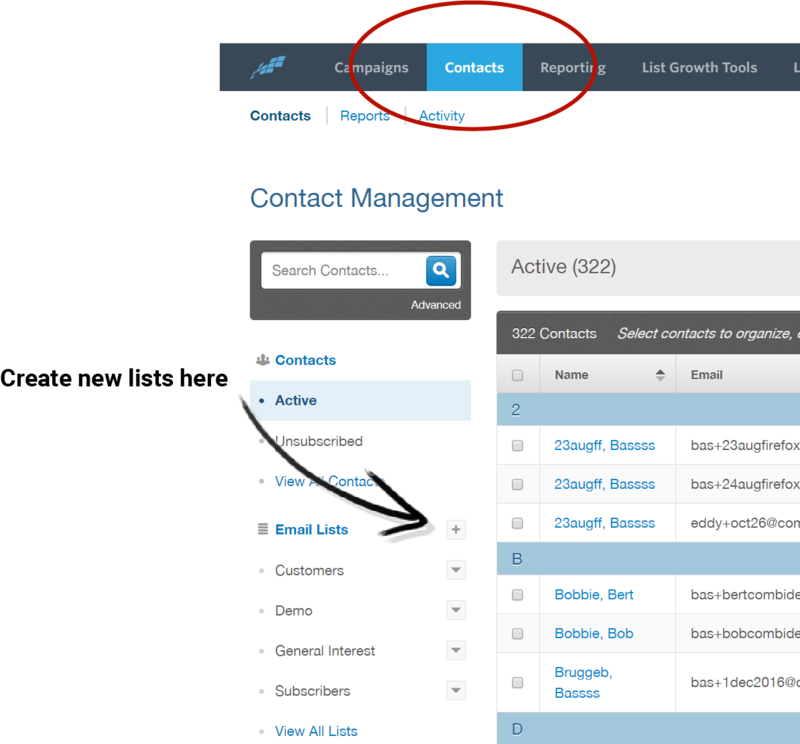 Select a list to add the contacts to by clicking the box (or click "Create a new list"). You can now use this list to send out campaigns bases on the specific custom fields.